Until now I mostly used the PHP API of the customizer. Since Weston Ruter’s post about the improvements of the Customize JS API in WordPress 4.9, I wanted to change that and learn more about the Customize JS API. This post shows you how to create panels, sections, and controls with that API. So I thought to myself, I will try it out at the next opportunity. And because my Hannover and Bornholm themes need a visual and technical update, I already had it. There is also a disadvantage of the Customize JS API: currently, it is not very well documented, so it takes some time to find information, even if the API is entirely written in one (or just some) core files, so theoretically one could extract its functioning from there. For me, that was just a little help. // Include scripts into the customizer. * Prints styles inside the customizer view. // Add script control section. 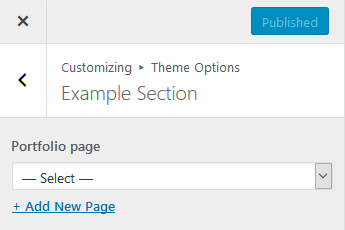 // Create theme options panel. We wait until the Customizer is ready and add a panel, section, and control. You can see that the code for adding each of the elements is quite similar. The first parameter of the new call is the ID, after that, there comes an object with the options, like known from the PHP API. And with that, we are at the end of this small introduction to the Customize JS API. Important is, that – generally – you define the settings with the PHP API – otherwise, the values are not stored in the database. There is a way to create settings via the JS API dynamically, but that is the topic of another article. Thanks for your nice post. It's really hard to get info on the customize JS API. Unfortunately, I have tried your code and could not get it to work. My customize-controls.js file is identical to yours, so I think the issue is that the script is not properly enqueued, do you know how can I check wether has been properly enqueued? To check if the script is enqueued, take a look at the source code in the customizer via the dev tools of your browser, and search for the script file’s name. And if it is enqueued, also check if the path is correct (just try to load the script URL in the browser). If the script is correctly loaded and it does not work, maybe the customizer setting needs to exist (be registered via PHP) – I am not 100 percent sure, maybe the control does not show up, if it has a value for setting that does not exist.